My father asked more of himself than others. Anxious to give his first year medical students a synopsis of the latest research, he thought his lecture wasn't good enough. To do a better job, he took his medical journals to bed with him. Hours later, rising from a sleep, he scribbled down a brief paragraph that would lead to the discovery of insulin. That was the night of October 30th, seventy-four years ago and how my father's name was first associated with Diabetes Research. 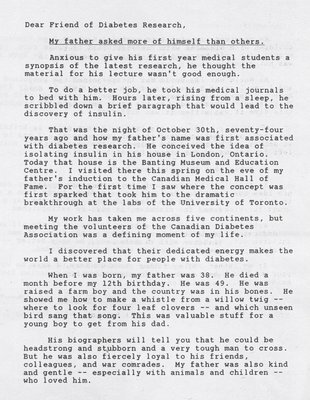 He concieved the idea of isolating insulin in his house in London Ontario. Today that house is the Banting Museum and Education Centre. I visited there this spring on the eve of my father's induction to the Canadian Medical Hall of Fame. For the first time, I saw where the concept was first sparked that took him to the dramatic breakthrough at the labs at the University of Toronto. My work has taken me across five continents, but meeting the volunteers at the Canadian Diabetes Association was a defining moment of my life. I discovered that their dedicated energy makes the world a better place for people with Diabetes. When I was born, my father was 38. He died a month before my 12th birthday. He was 49. He was raised a farm boy, and the country was in his bones. He showed me how to make a whistle from a willow twig -- where to look for four leaf clovers, and which bird sang that song. This was valuable stuff for a young boy to get from his dad. He recieved grateful letters from thousands of children with diabetes which he would read, late at night, with soft tears in his eyes. He knew insulin was not a cure. As World War II approached, he re-joined the army and I saw less of him. One night in early 1941 he came home and asked me to come to his study with him. Invitations to his study usually meant trouble, but this time it was different. He quietly told me he was going to Britain on war buisness, and that it was a secret. I was to work hard at school and help with the chores. The next morning he left for Ottawa to catch his plane. In front of the house where my father conceived the idea for insulin -- a flame burns from a cairn. It is called the flame of hope, and on the day a cure is found for diabetes, it will be extinguished. With your support harnessed to the all-out efforts of dedicated researchers -- the lives of men, women, and children will be made better -- and eventually a cure will surely be found. If my father were here, I know he would cheer your good work by supporting the Canadian Diabetes Association. Based on the tone of the letter, "Friends of Diabetes Research" are presumably volunteers with and/or donors to the Canadian Diabetes Association.